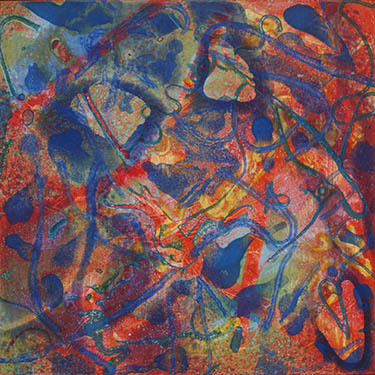 Abstract Art Exhibit “DRIVEN TO ABSTRACTION”, Energy and Color in Santa Barbara. Original Contemporary Paintings by CYNTHIA MARTIN, KERRIE SMITH and MARLENE STRUSS. 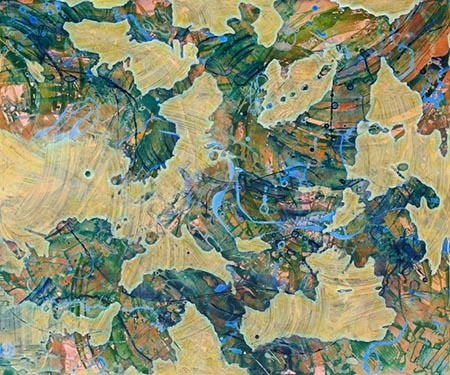 Corridan Gallery is pleased to present "Driven to Abstraction", an Exhibit of Abstract Paintings by CYNTHIA MARTIN, KERRIE SMITH and MARLENE STRUSS. These fine Santa Barbara artists have created work in three unique and highly original styles. This refreshing exhibit will be on display from April 1 through May 6, 2017. There will be a Reception for the Artists on Saturday April 8 from 4:00 to 7:00pm. "Light Patterns #10"Acrylic on Canvas, 48" x 36"
"KERRIE SMITH'S paintings capture the rapturous relationships of time, light and nature. Her Light Patterns series reference this dynamic relationship primarily though her juxtaposition of dense color layers within an abstract geometric compositional structure. 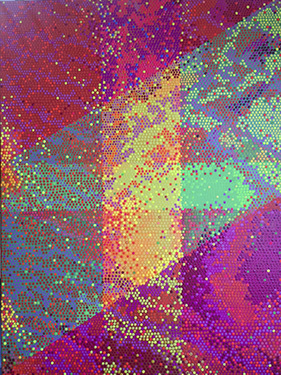 The color layers composed of meticulously organized dots form cloud like patterns of light, which flow through and across the geometric boundaries of the surface. Smith’s Light Patterns are a idiomatic language she has created to communicate to us the ephemeral interplay of light and the tangible structure of the physical world. 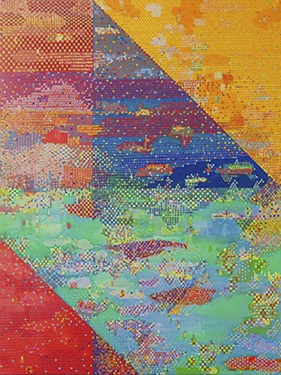 Her richly textured patterns of color simultaneously define and erode the geometric boundaries within the paintings." MARLENE STRUSS'S Acrylic paintings on board exhibit energetic passages reacting to one another in original combinations of color and composition. She experiments with the properties of acrylic paint in the pursuit of dynamic organic forms and color with a rich textural surface. Layered processes of addition and removal, outline, flow and resistance yield unexpected three dimensional qualities. The layers are dripped, splattered, puddled, blown and scraped using straws rags, wood slats and sprayers. each layer is force dried and rubbed before the next is applied, resulting in a crisp, polished surface. The painted panel itself records the series of events of its creation and becomes the final piece without any frame, varnish or other interface. Watching the transformation of the landscape in the real world of Southern California, has become a compelling theme in CYNTHIA MARTIN'S paintings. Responding to her angst about the vanishing natural world, she uses fragments of landscape to evoke concepts of memory and loss. Large paintings of ominous clouds make a statement of warning. Sidebars of bright colors scream for attention beside canvasses of anemic skies, implying the fact that we have “extracted” from nature its essential elements to feed the voracious appetites of our ever-consuming society. 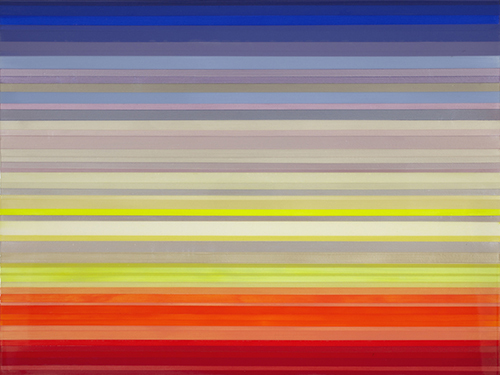 Her most recent work reductively abstracts the simplest proportions of landscape composition and color. 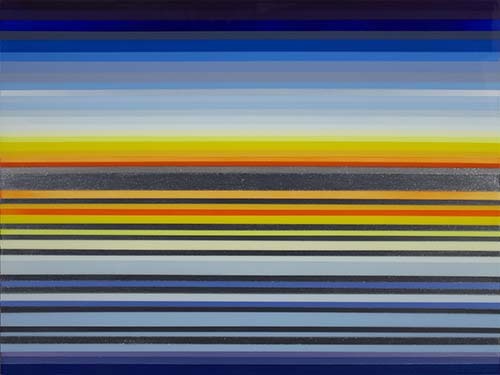 Hues of Sunsets or Ocean Views combine with the colors of Oil Spills and Commuter Traffic. The end result is invariably a powerful statement.